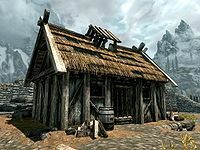 Ysolda's House is a small house in Whiterun, located behind Arcadia's Cauldron and Belethor's General Goods. It is the home of local merchant-to-be Ysolda, who lives there alone. It consists of one area only, Ysolda's House. There are two shadowmarks found here: an "Empty" shadowmark is to the left of the entrance door and a "Thieves' Cache" shadowmark is above a chest on the side of the house. The house is rather small and cramped and it is divided into two sections by a wooden wall. 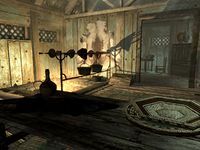 The first room contains a cooking spit beside a huge fireplace and a table that contains a wolf pelt and a bottle of alto wine. Two sets of shelves hold nothing but two food sacks and some leather strips. The second room is Ysolda's bedroom and contains her owned bed and an end table that contains clutter and has a bottle of alto wine on top and a pair of boots on the floor below. A wardrobe hold various clothes while a small table has a bowl with three potatoes and a copy of A Gentleman's Guide to Whiterun. At the end of Ysolda's bed is a chest that contains some gold and/or some minor loot. If you chose to live here after marriage, sleeping in the single bed will still give you your Lover's Comfort resting bonus, but the house does respawn after ten days. If you choose to marry Ysolda you can move in with her, but she will not open her store until you move into your own house. This page was last modified on 3 May 2018, at 23:07.